As a Stonyfield blogger, I was compensated for writing this post as part of my agreement with Stonyfield. All opinions and thoughts are all mine. The title of my blog is not a lie. I love the simple things in life. Things like chocolate, peanut butter, and brownies. Combine them together and you get this lovely masterpiece! 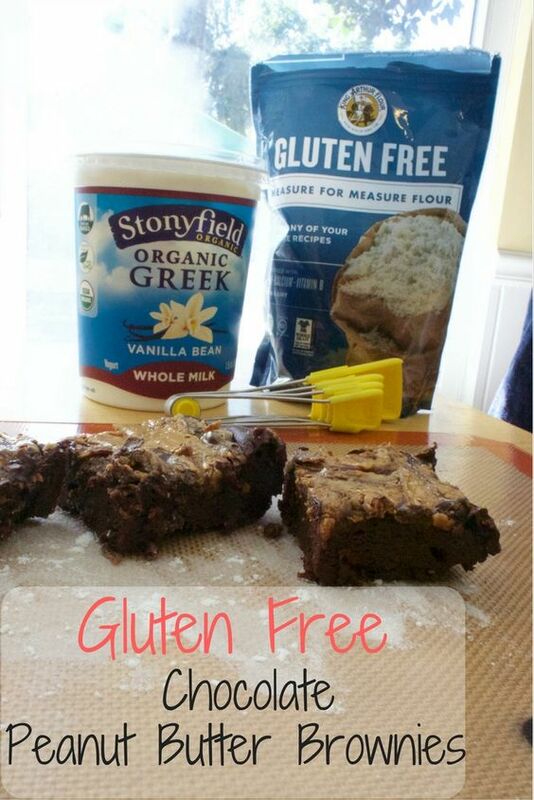 I recently had the opportunity to try King Arthur Gluten Free Measure for Measure Flour and decided to use it with recipe. Five years ago I would have had to buy all different kinds of flours in order to make my own gluten free all purpose flour, but now, thanks to King Arthur, life is much simpler. All the ingredients I need, condensed into one sweet little package to use in just about any recipe! Preheat the oven to 350°F. Spray an 8" x 8" pan with baking spray. Add all of the of the ingredients except for the chocolate chips and peanut butter and mix together. I used a hand mixer to mix the ingredients together. Microwave the peanut butter in a microwave safe bowl until it's easy to spread. Drop spoonfuls of peanut butter onto the batter and create a swirl effect using a knife or toothpick. Bake for 23 - 27 minutes or until a toothpick or knife inserted in the middle comes out clean. By the way... I LOVED using the Lavooon spoons and the Silpat Mat. They made creating this recipe so easy and simple! The would be the perfect pairing for that Christmas Cook on your list this year! Do you have a favorite simple recipe you like to make? Mine will always be brownies!